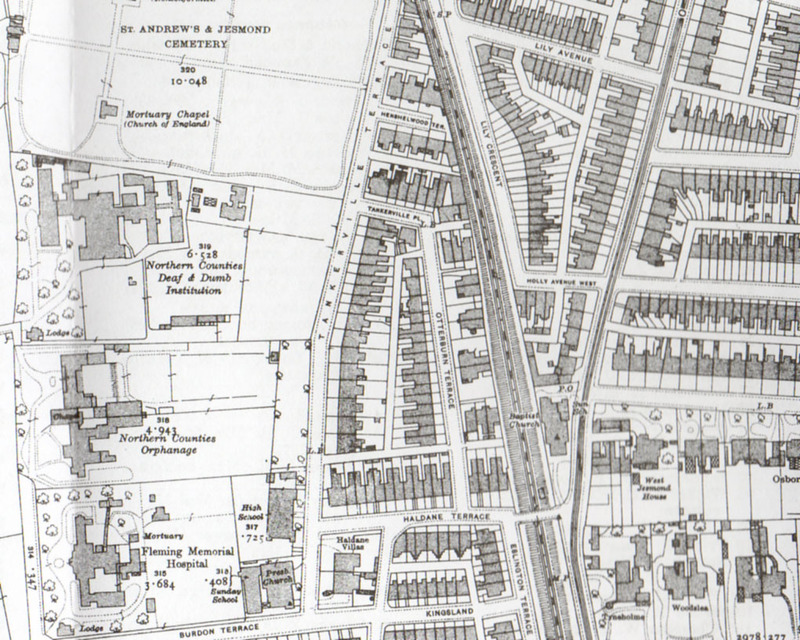 Extract from ‘Ward’s Directory of Newcastle 1893-4’ reproduced courtesy of Alan Godfrey Maps: Jesmond 1895. 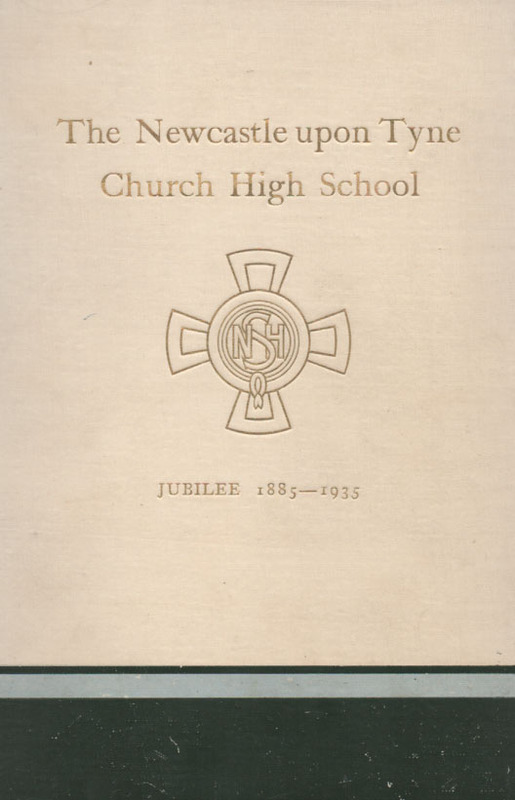 The Newcastle Upon Tyne Church High School Jubilee Book: 1885-1935. 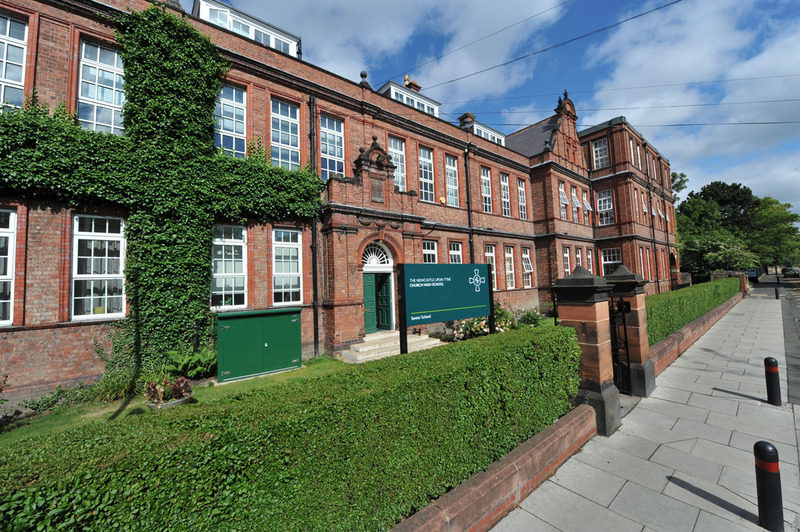 The decision was taken to purchase a small but flourishing private school in Jesmond Road as the nucleus of their new Newcastle school. This thriving private school, originally owned by a Miss Hewison, was chosen because it had an excellent reputation in the City and so ‘on October 10th, 1884, an agreement for the purchase of the goodwill of the school was drawn up. The school was to be carried on in the same buildings, numbers 54, 56, 58 and 60 Jesmond Road, and it was arranged that Miss Hewison should stay on as House and Music Mistress and that some other members of the staff should be retained. Three of the original houses on Jesmond Road, all with green doors, still survive today: Numbers 56, 58 and 60. (The remaining evidence of the chimney of Number 54, now demolished, can just be seen to the right of the image behind trees). Original badge and motto for Newcastle High School for Girls. Note the Christian fish symbol at the base of the cross. 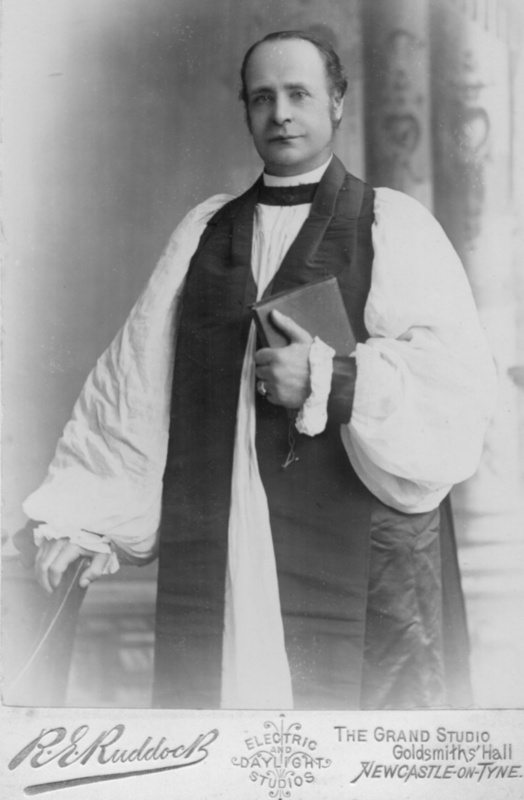 The newly-created Bishop of Newcastle, Dr Ernest Wilberforce, was asked and agreed to become the School’s Patron and, representing the Church Schools Co. at the Opening Service in Jesmond Parish Church, Canon Francis Holland stated that ‘the Newcastle school stood first in the interest of all the Company’s schools, for it was founded on an already good school ….. and promised on behalf of the Company that if the numbers increased the school should have new buildings. 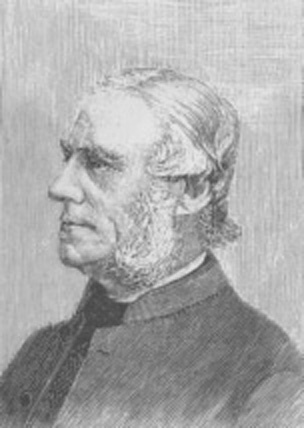 Ernest Roland Wilberforce: the first Anglican bishop of Newcastle on the creation of the diocese in 1882 and grandson of William Wilberforce, leader of the movement to abolish the slave trade. ‘By the end of 1886 the numbers in the school had reached 80 and negotiations were begun for the purchase of a new site. Early in 1887 the present site in Tankerville Terrace was secured, but for some now undiscoverable reason, building was not immediately begun ….. 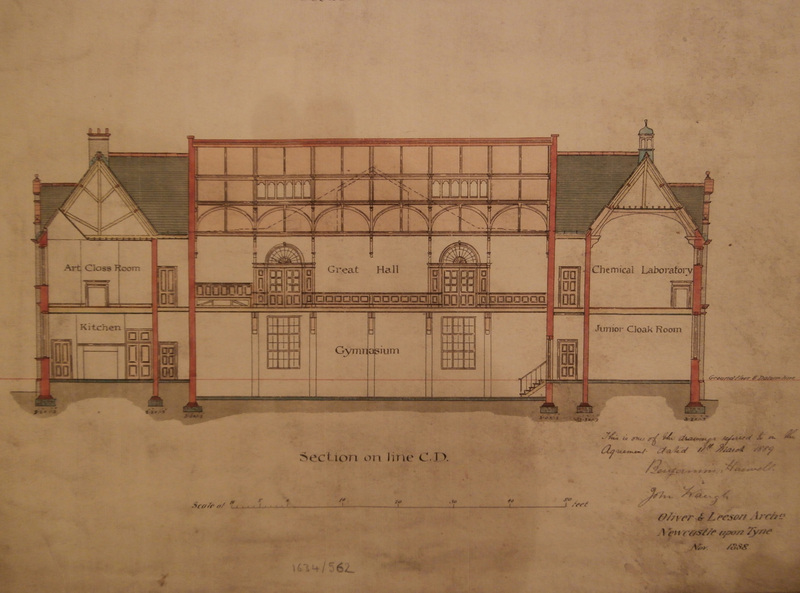 It was not until a year later, June 1888, that Messrs. Oliver & Leeson were appointed architects, and their plans were approved shortly afterwards’. 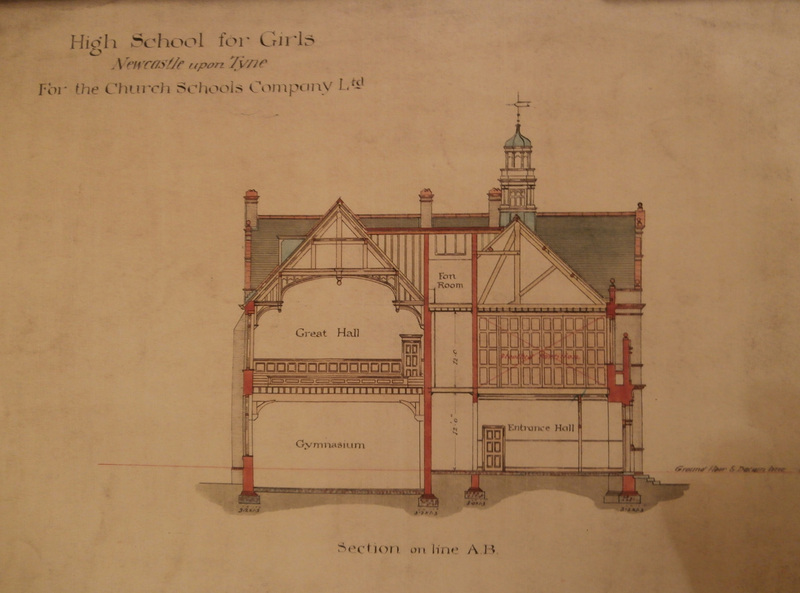 Although Newcastle High School is a relatively early example of Oliver & Leeson Architects’ work in Newcastle, ‘The Building News’ published on September 12th, 1879 featured their Highly Commended design for The City of London School. Characteristically, the firm ‘had a particular penchant for giving their large commercial buildings copper-clad domes and idiosyncratic dormers’ and became ‘one of the most dynamic in Newcastle with a huge output which included buildings of great originality of style. The work encompassed: the building and restoration of churches; schools and colleges; hospitals; office blocks; warehouses and banks.’ [p.213, ‘The Arts & Crafts Movement in the North East of England: A Handbook’, Barrie and Wendy Armstrong, 2013]. Following the submission of Oliver & Leeson’s plans to the Town Improvement Committee, a newspaper article outlining the description of the proposed new High School appeared in the local press. 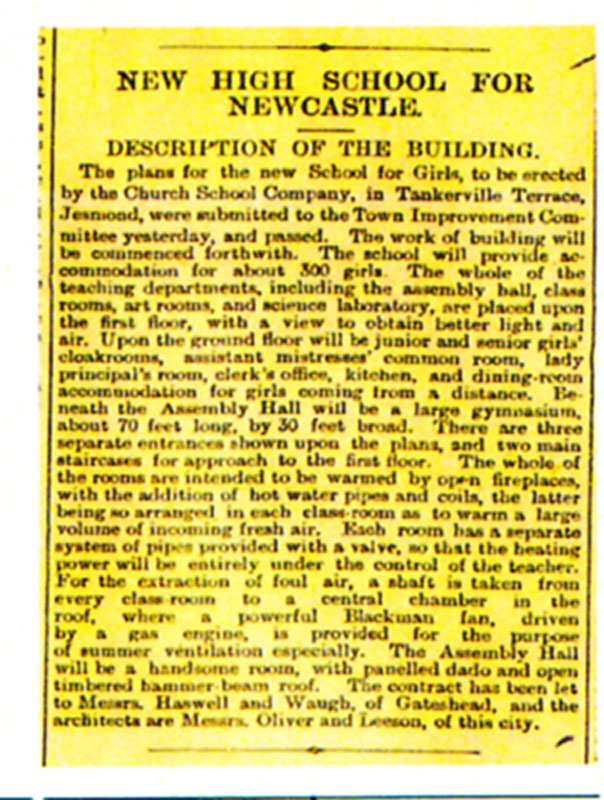 Local press article c 1888 on the New High School, possibly from The Newcastle Courant. 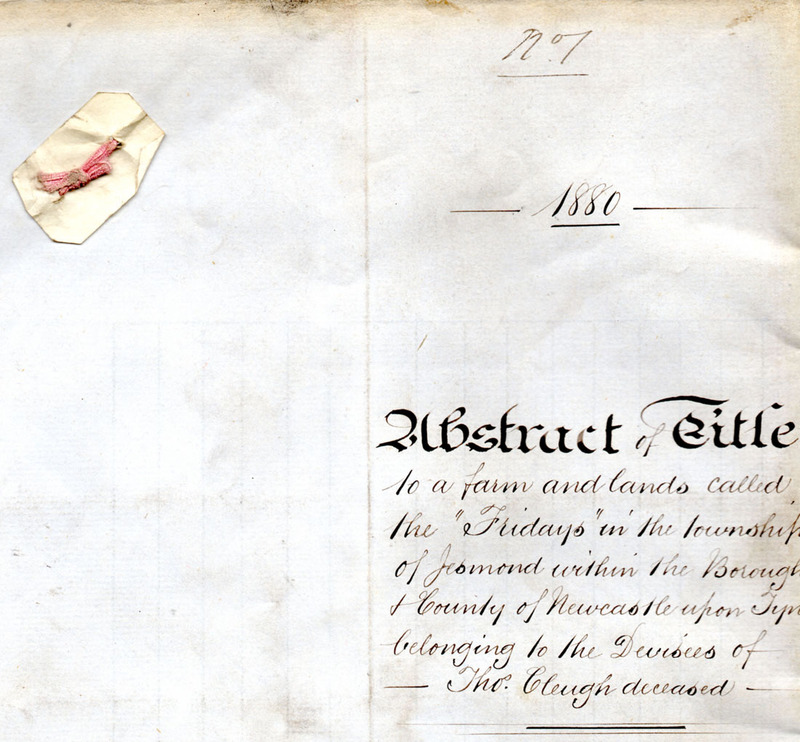 The Church Schools Company Council Minutes for April 29th 1889 state that ‘the Contract for the erection of new buildings at Newcastle for £4911.12.6 was produced’ and the Company Seal duly attached. The contractors were Messrs. Haswell and Waugh, of Gateshead. Although ‘Topping Out’ ceremonies are traditional, we know there was no official ceremony on completion of the Newcastle High School build. The Minutes for April 29th also confirm that ‘the question of holding a Ceremony in connection with the laying of the Foundation Stone of the building was considered and a letter was read by the Chairman, which he had received from the Rev. S.E. Pennefather [then Chairman of the Local Committee], on the subject, and it was finally Resolved to postpone any Ceremony until the opening of the School’. The reason for this is in the Minutes of the Education Committee for March 14th which note that ‘a letter from the Architects dated 12th March was also read stating that in consequence of the strike of plumbers and the anticipated strike of masons, joiners, carpenters, etc, it would be advisable to postpone the Opening Ceremony of the new buildings’. 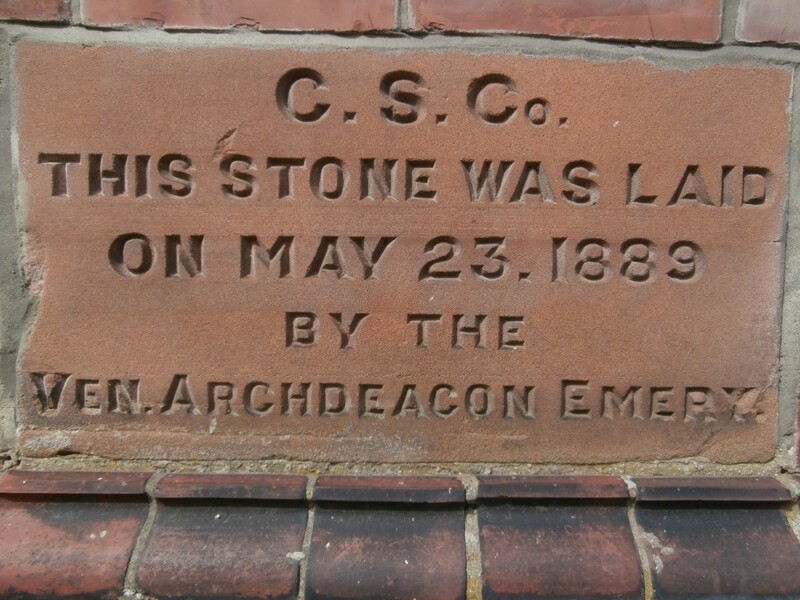 Instead, The Venerable Archdeacon William Emery of the Church Schools Co. formally laid the Foundation Stone on May 23rd, 1889. 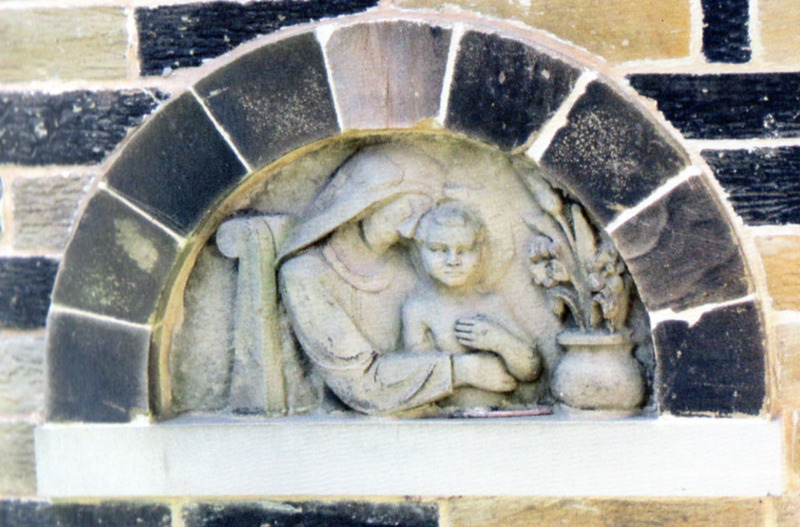 Initially positioned to the left of the South door, traditionally the pupils’ entrance, the stone now sits low to the left of the Front Door. The NHS Tankerville building’s 1889 Foundation Stone. 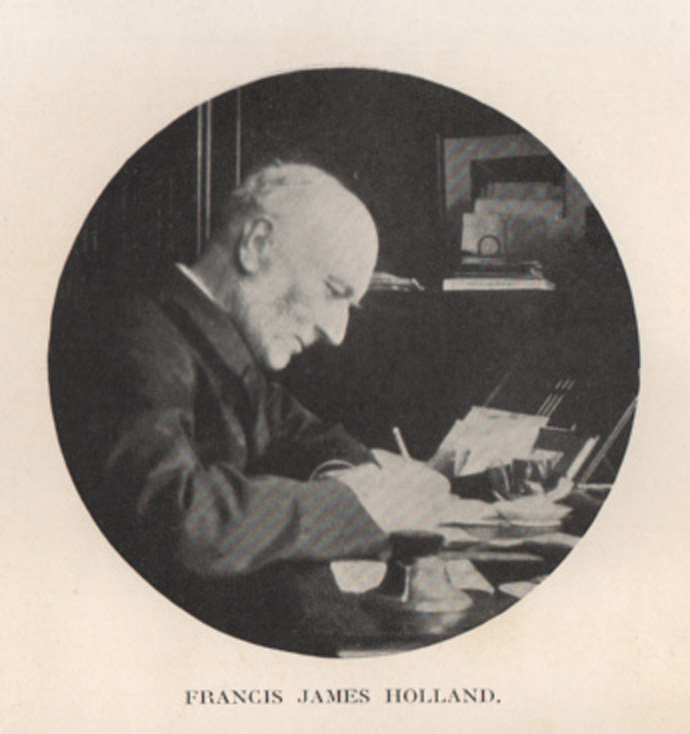 On May 3rd 1890, the new purpose-built school (the first in Jesmond) was officially opened by Miss Helen Gladstone, Prime Minister W. E. Gladstone’s daughter, at a dedication service held in Jesmond Parish Church. 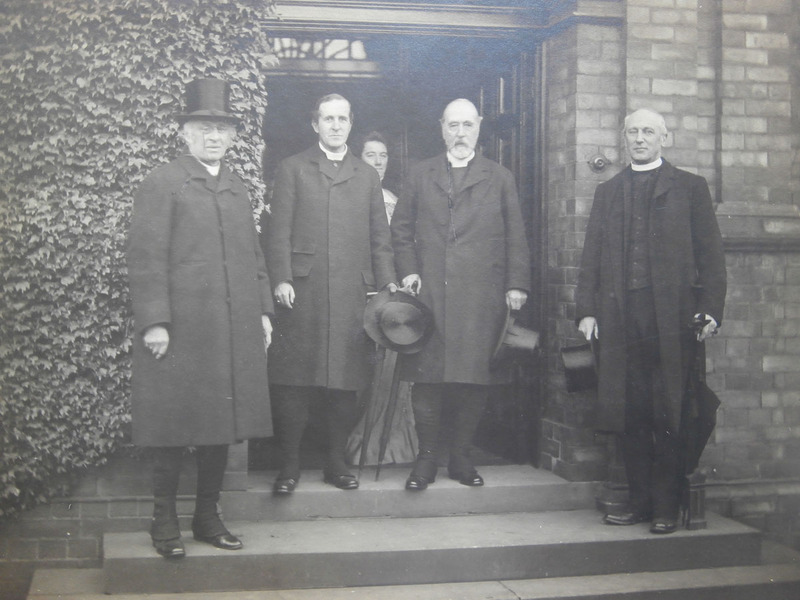 The platform party included: the Bishop of Newcastle, Dr Ernest Wilberforce; the Venerable Archdeacon Hamilton; Canon Pennefather; Dr Garnett, the Principal of Armstrong College, Newcastle; and other members of the Local Committee. 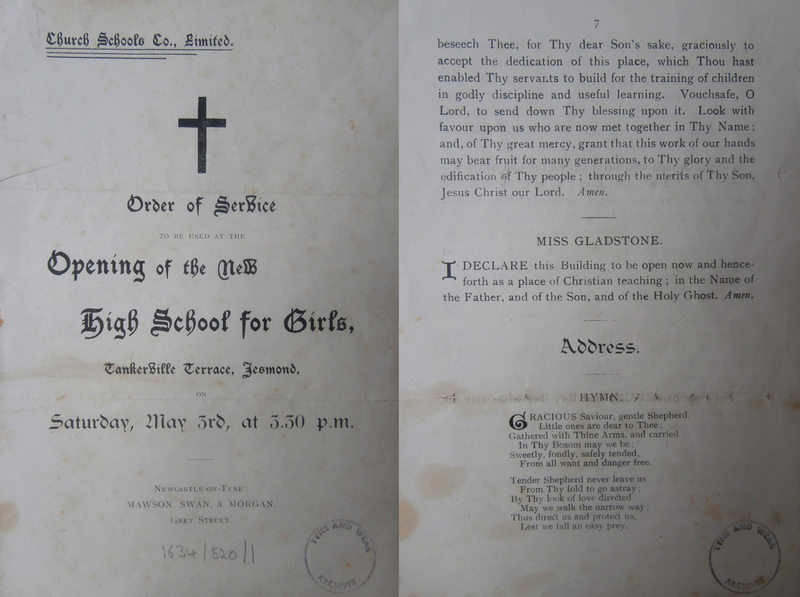 Front Cover and Page 7 of the Order of Service for the Opening Service for Newcastle High School. The actual words spoken by Helen Gladstone are shown in the centre of the second page illustrated and enlarged below. [Tyne & Wear Archives]. 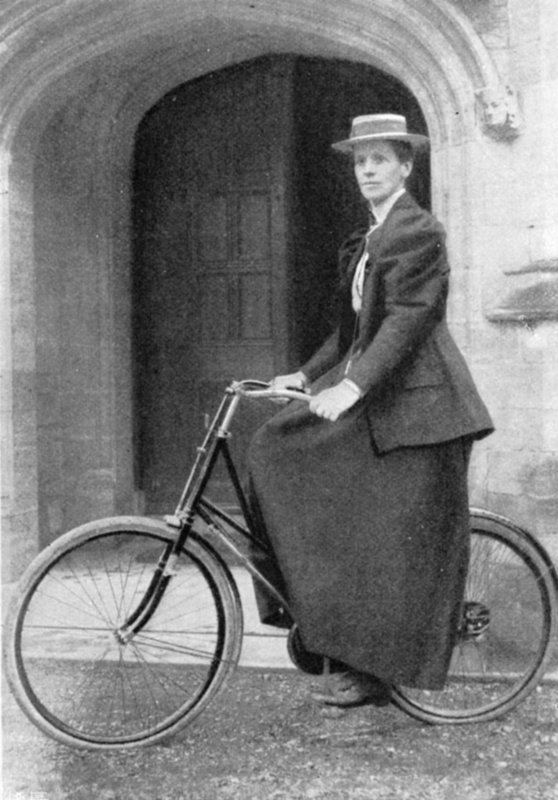 A key figure on the Council of The Church Schools Company, Helen Gladstone also served as the Vice Principal of Newnham College, Cambridge, a post she held from 1882 until 1896. 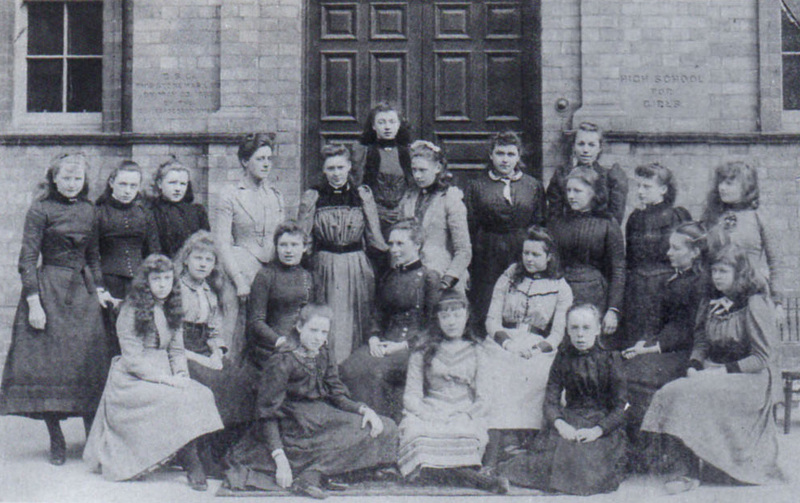 A student at Newnham herself between 1877-1889 (starting with the September intake of women following Miss Ackerley’s graduation), Miss Gladstone began her career as an educationalist by working as Secretary to the College’s first Principal, Anne Jemima Clough, between 1880-1882. 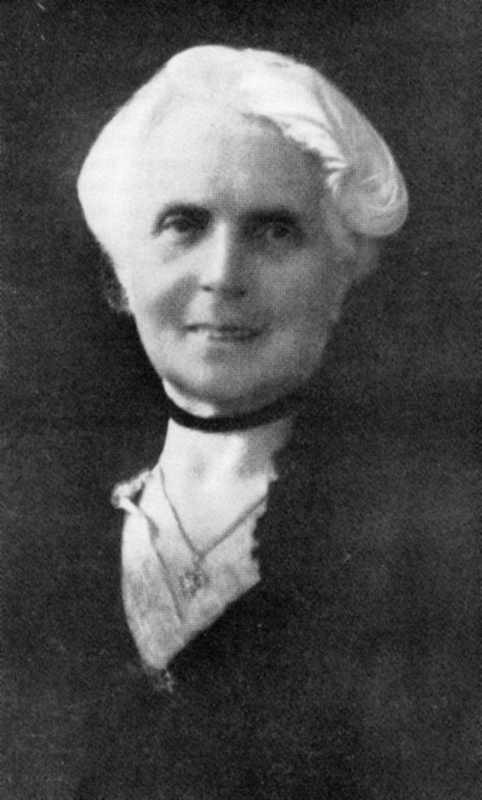 A life-member of the Governing Body, the Newnham connection was undoubtedly the reason Helen Gladstone agreed to come to Newcastle to open the new school on behalf of the Company, as minuted in April 1890. By this time, she had also co-founded the Women’s University Settlement, located in Nelson Square in Southwark, London, of which she became the first live-in Warden. 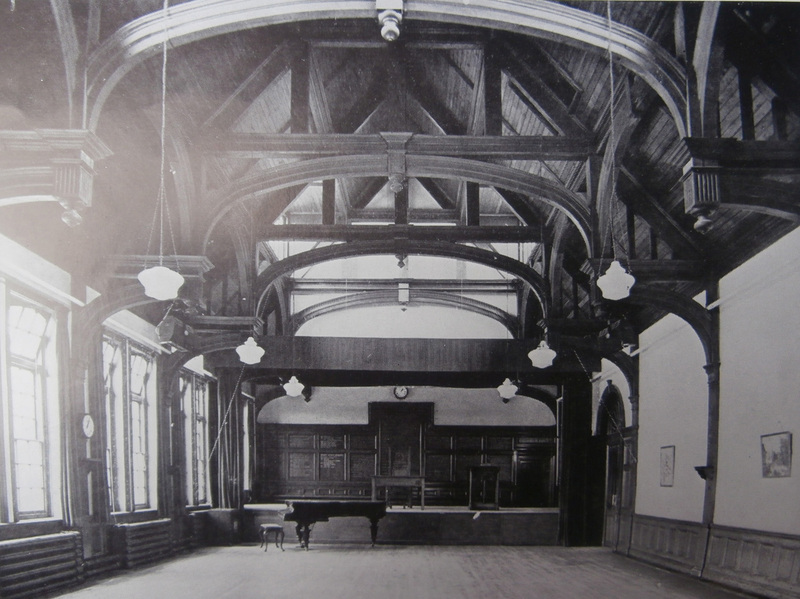 At the heart of the new building was a magnificent first floor Assembly Hall, described in the 1888 local press article as ‘a handsome room, with panelled dado and open timbered hammer-beam roof’. The platform end of the magnificent NHS Arts & Crafts Hall. 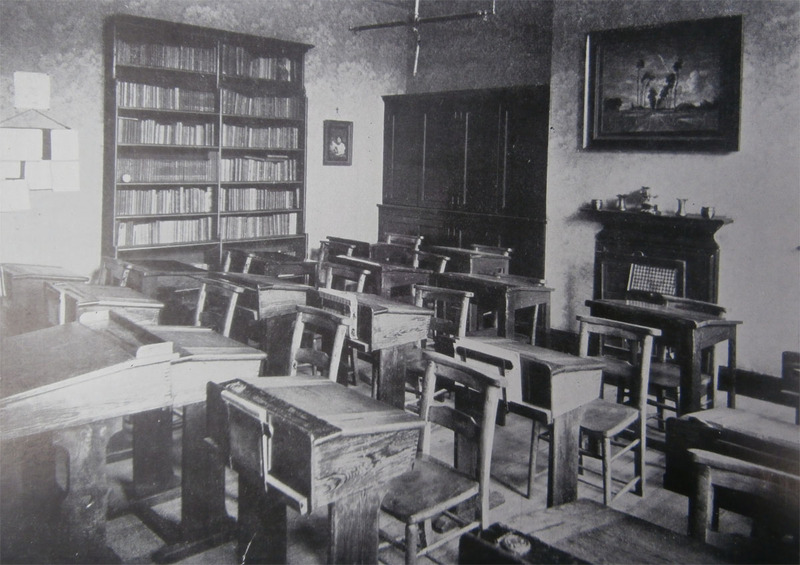 An original classroom in Newcastle High School’s new building. 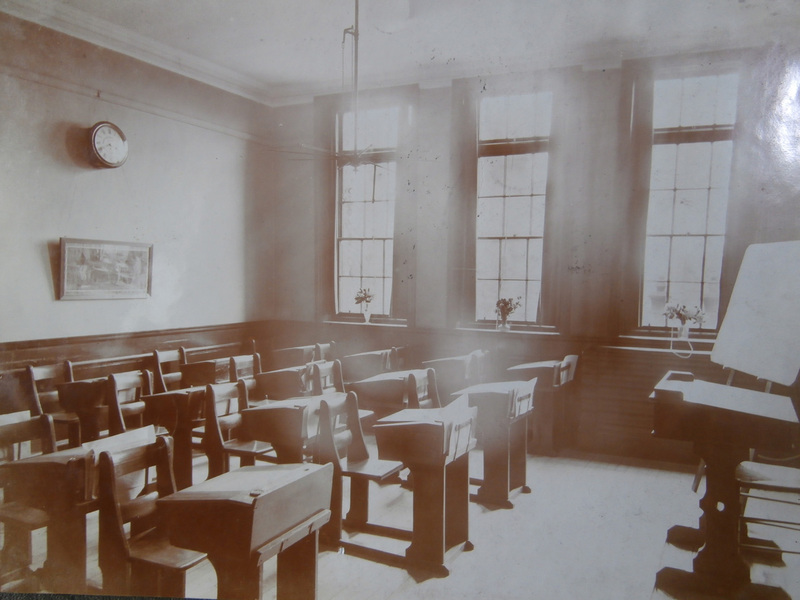 We know that Miss Ackerley wrote to the Church Schools Company on April 18th 1890, prior to the Opening Ceremony, requesting 20 additional curtains for the School. Whether she received them or not remains a mystery, the Council Minutes only noting that the matter was deferred, ‘the Architects having stated in a letter that they did not consider them necessary’. The dawning of a new ‘Modern’ era perhaps? The building originally featured a bell tower cupola at its centre; in later years, the tower was demolished after falling into disrepair. Newcastle High School building in 1900 with its bell tower. 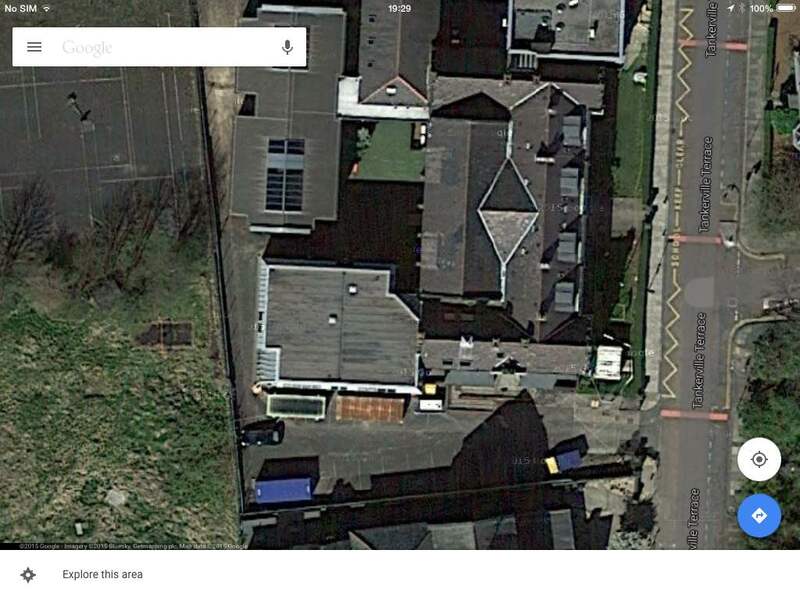 2014 Google Maps image of Church High main building; the site of the bell tower was near the lozenge-shaped area. 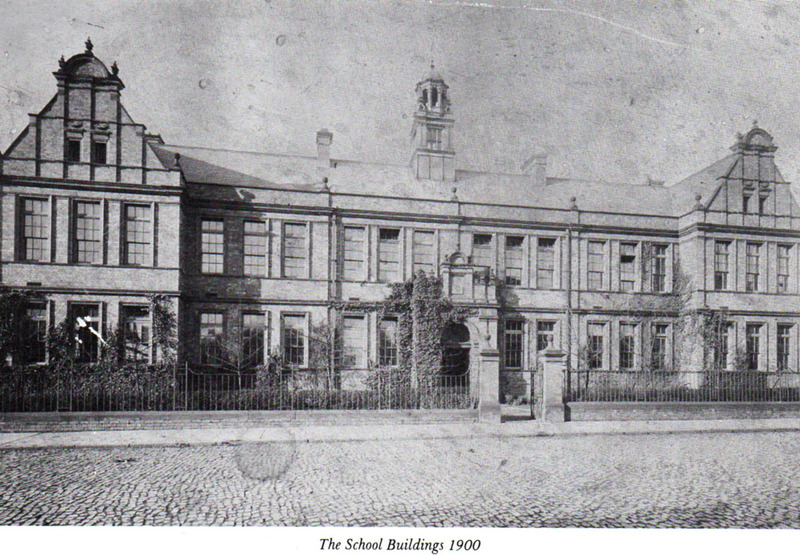 In 1894, as Olive Carter records in her History of Gateshead High School & Central Newcastle High School, the G.P.D.S.C. made a rather optimistic offer ‘to buy the Church Schools Company’s building to use for its own new school; the offer was refused.’ This is confirmed by the Church Schools Co. Council minutes for July 1st 1894 when a resolution was passed ‘to inform Mr Tarver that the Council had no intention of abandoning their School at Newcastle on Tyne, and that it was hoped that care would be taken to avoid such a position, for the proposed school of the Girls Public Day School Company might create needless rivalry between the two Schools.’ Undeterred by the refusal and anxious to develop a foothold across the Tyne, the G.P.D.S.C. 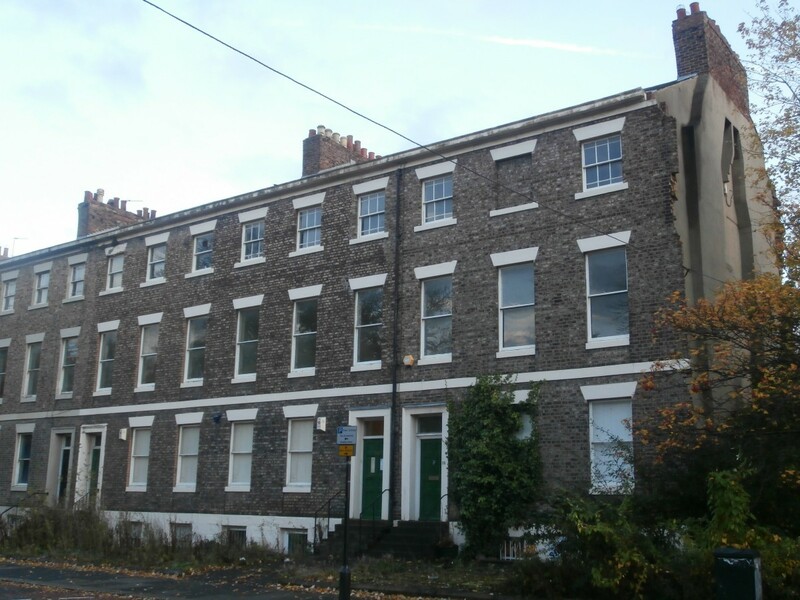 decided to purchase land on Eskdale Terrace, a little over two streets away from the Newcastle High School building and just outside of the Jesmond Ward. Their initial intention had been to create a ‘feeder’ school for Gateshead High School, where the pupil numbers had begun to fall markedly in the 1880s following the establishment of three Church Schools Company High Schools in the North East. Postcard of the G.P.D.S.C.’s building on Eskdale Terrace. Initially opening in 1900 as the G.P.D. 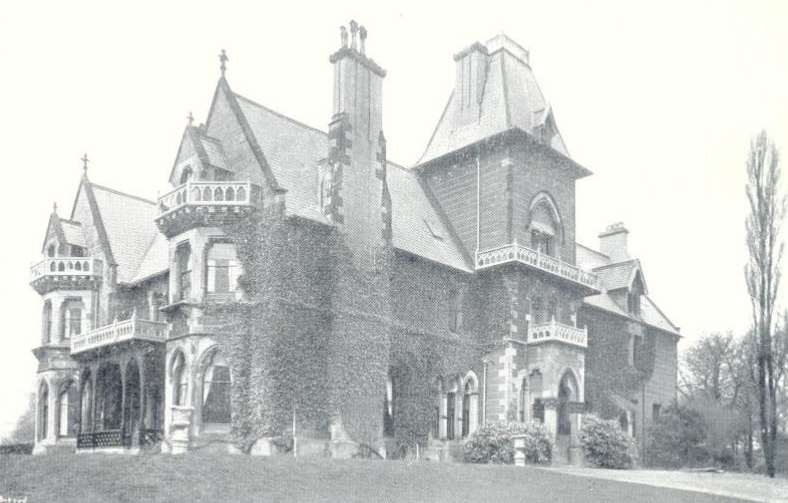 Preparatory School in Jesmond, the new building on Eskdale Terrace ultimately began to operate as a High School. 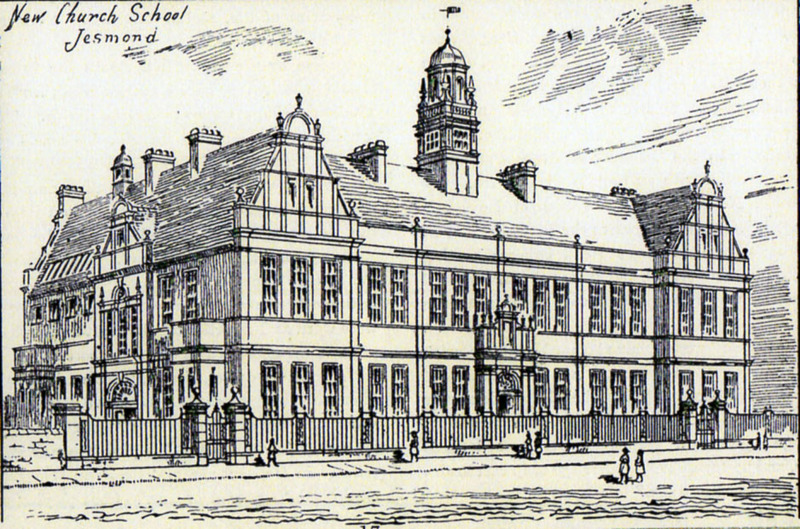 Presumably owing to its position within the Central Newcastle Ward, the new school became The Central Newcastle High School. Olive Carter also goes on to tell us that ‘later, in 1910, the name of Central was altered to “The Girls’ High School, Newcastle upon Tyne”, but a year later it not unnaturally had to revert to the original as a result of objections by the Church Schools Company [there already being a High School for Girls in Newcastle upon Tyne!]. Thus the rivalry that would have been natural between two schools of a similar type, housed moreover very near one another, probably owes a good deal of its vigour to historical causes.’ Up until 1907, when the G.P.D.S.C. finally closed down its Gateshead school, Gateshead High School and Central Newcastle High School ran as two separate schools. 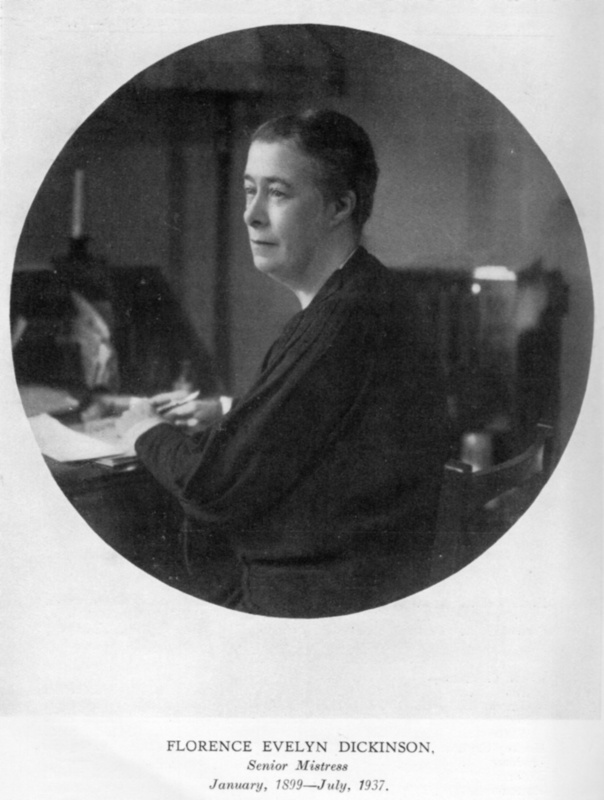 By the tenure of the School’s third Head Mistress, Miss Louisa Gurney, who had previously taught at the North London Collegiate School for Ladies and would later attempt to model Newcastle High on Cheltenham Ladies College, a flourishing Newcastle High School for Girls decentralised administratively from London in 1909 and became a self-governing Independent Church School in 1925. At this point in its history, a Company limited by guarantee was formed and the School was renamed The Newcastle upon Tyne Church High School. The Centenary Book tells us that ‘the Association consisted of parents, Old Girls and friends of the School, whose liability was limited to £1 if the School were to cease operating’. The School buildings were bought for £10,100 and a Board of Governors now controlled affairs: ‘The Bishop of Newcastle was to be President of the Association, thus continuing his patronage of the School. The Provost of Newcastle and the Vicar of Jesmond were ex-officio Governors. The remaining Governors were to comprise one member of the Association appointed by the President, one member appointed by the residentiary Canons of the Cathedral, six lay members of the Association, of whom three at least were to be ladies, elected in the annual general meetings and up to four members of the Association co-opted by the Governors’. The School was run very successfully in this format for the rest of its time. New photographic postcards were produced in 1925 following the change of name on gaining Independent status. 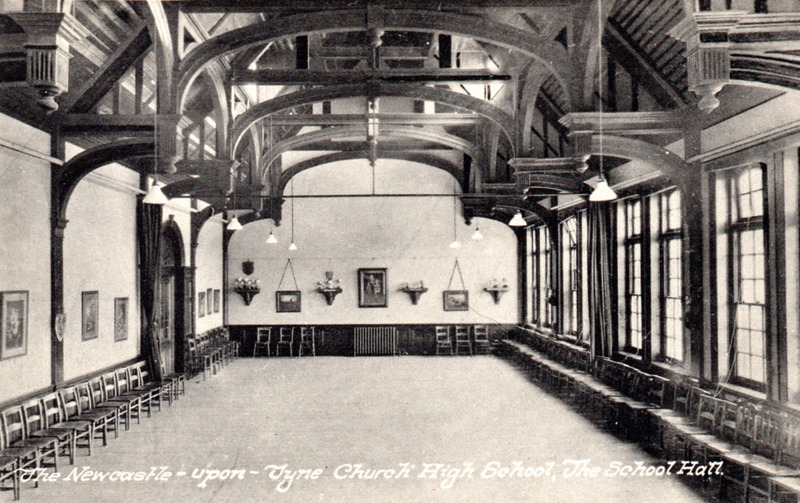 Above: the School Hall with its recently acquired House Brackets depicting the Four Virtues mounted on the South wall. The brackets were carved by Mr John W.M. Reid, Master of Modelling & Sculpture at Armstrong College, Newcastle. 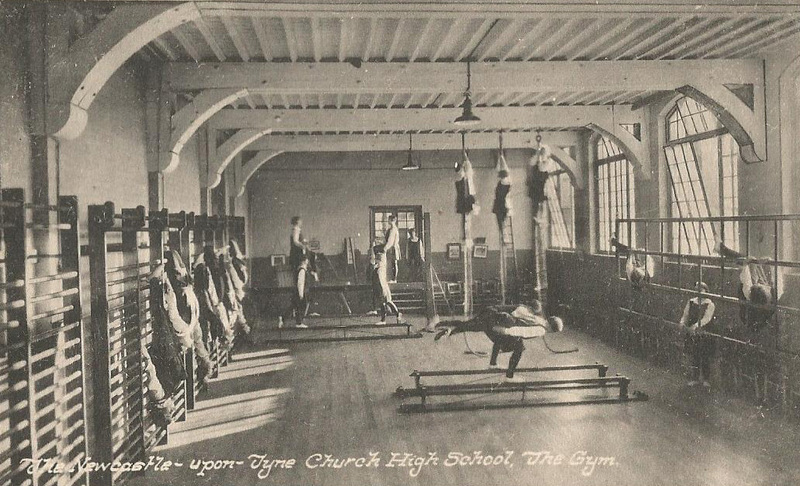 Below: Church High possessed the first Gymnasium in the City. 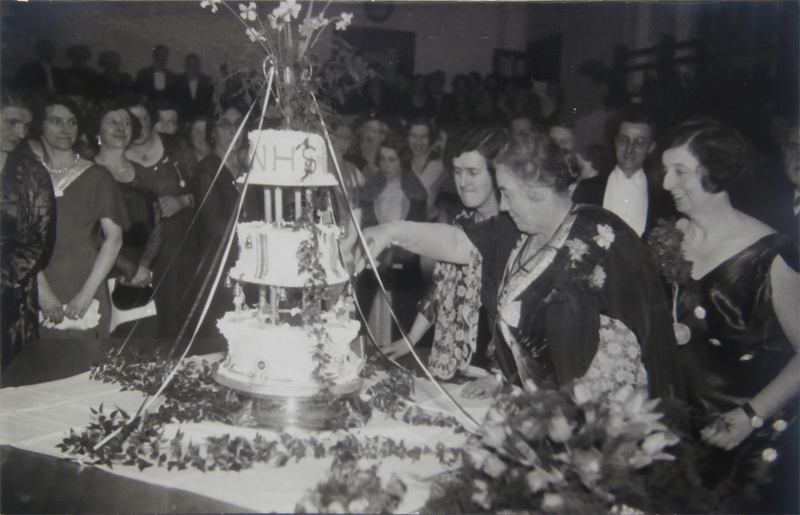 The School celebrated its Jubilee year in grand style in 1935, with Miss Gurney still at the helm, ably supported by the indefatigable Miss Florence ‘Dickie’ Dickinson, the only School Deputy Head to be honoured by a biography in either history. The celebrations took place between January 18th-21st, commencing with a special Prize-giving presided over by the Duchess of Northumberland (Lady Helen Percy), the Bishop of Newcastle and all three Head Mistresses: Miss Ackerley, Miss Sidall and Miss Gurney (the latter two both graduates of Girton College, Cambridge, the first higher education establishment founded for women). 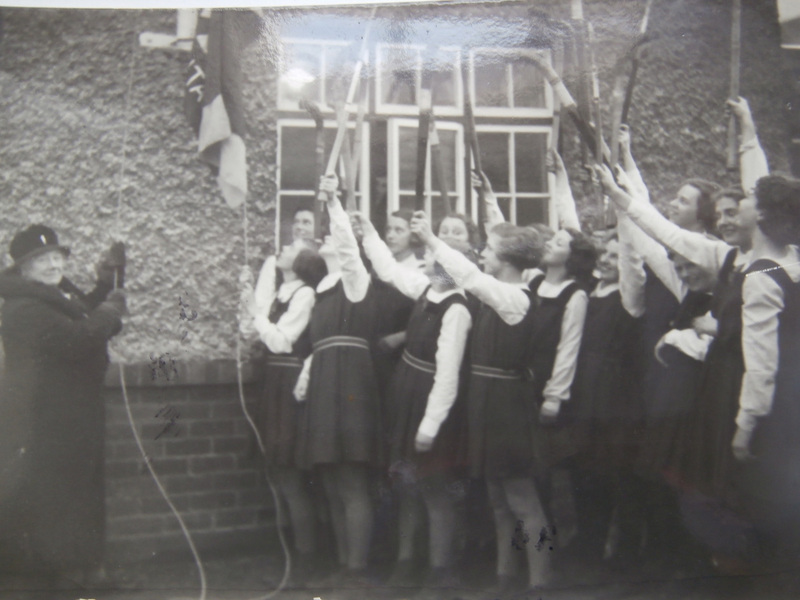 A Reception at Tankerville Terrace included a ‘Room of Memories’ and a ceremonial cutting of the cake by Miss Gurney, whilst on the Reid Park Road playing field the three Head Mistresses attended a ‘Breaking of the School Colours’ ceremony where Miss Gurney hoisted a flag bearing the School motto ‘Vincit Omnia Veritas’ in true naval fashion. On the actual Birthday (January 21st), there were two church services – one at Jesmond Parish Church, the other a Thanksgiving at St Nicholas’ Cathedral – followed by the Jubilee Luncheon and Dance at the Assembly Rooms, attended by the Lord Mayor, where the school flower (the Chrysanthemum) was very much in evidence. I am sure the School Song, ‘Forty Years On’, will have been sung quite a few times too. The fact that Church High’s foundations and traditions were ‘so well and truly laid’ is a debt owed to Louisa Mary Gurney and Florence Evelyn Dickinson. Always a happy school, Church High boasted a pattern of long service from its staff at all levels, but it is the long partnership of these two individuals which developed the school most. In 1936, Miss Gurney retired as Head Mistress having ‘shaped the destiny of the School and given it the impress of her personality’ for 34 years. Miss Dickinson stayed on for one more year, retiring in July 1937. Miss Gurney dedicated her life to the School and is its longest-serving Head, but, for Miss Dickinson, it really was ‘the end of a lifetime’s service.’ She came to the School first of all at Jesmond Road as a young girl in 1886 and returned as an Assistant Teacher in 1899, rising ultimately to Senior Mistress: 38 years of service in all. 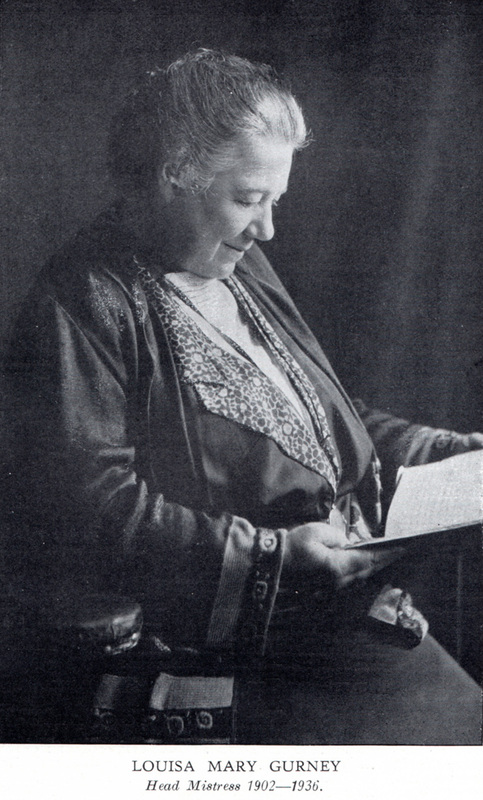 Miss Louisa Mary Gurney, Head Mistress from 1902-1936, on her Retirement: NCHS Magazine, 1935-6. 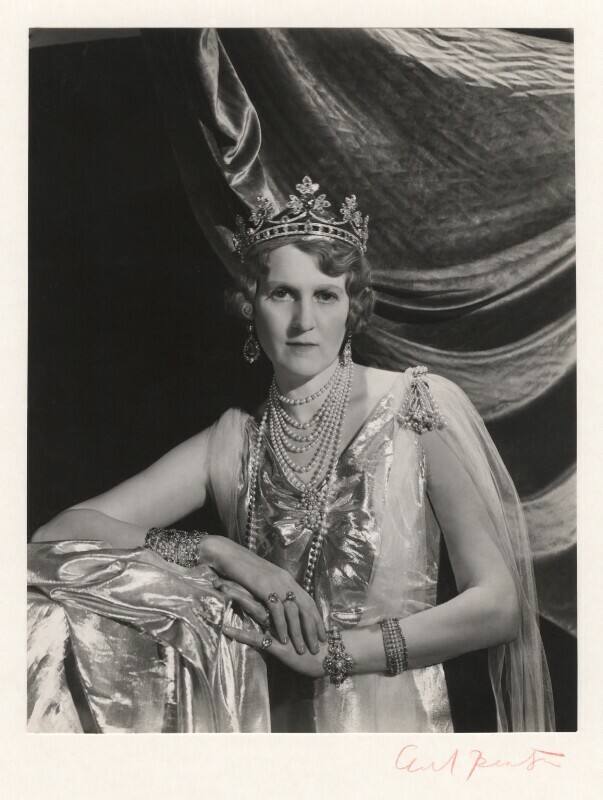 Miss Florence Evelyn Dickinson, Senior Mistress, on her Retirement: 1936-7 Magazine. 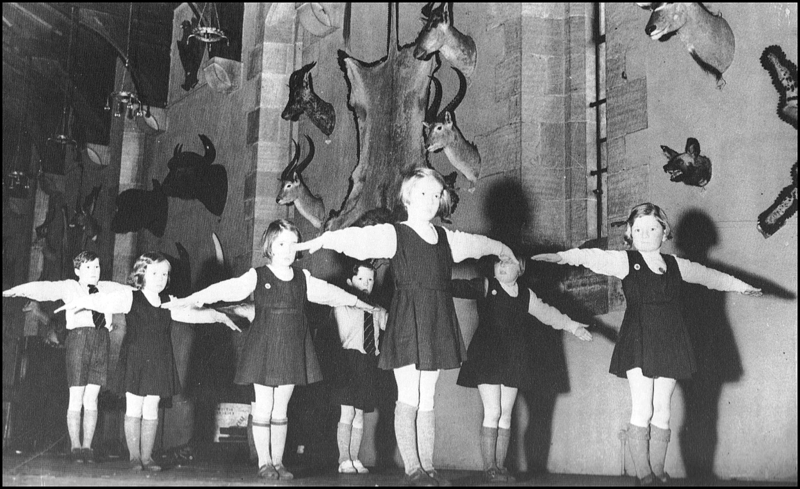 A School exercise class in the Great Hall of Alnwick Castle (above) & girls enjoying Recreation on the castle walls (below). Post Millennium, the Newcastle upon Tyne Church High School continued to thrive, evolving with the times. The ‘New Century Challenge’ led to extensive redevelopment of the Tankerville site infrastructure under Mrs Lesley G. Smith and the School roll was greatly expanded following the closure of La Sagesse School in 2008, when the majority of pupils transferred to Church High. 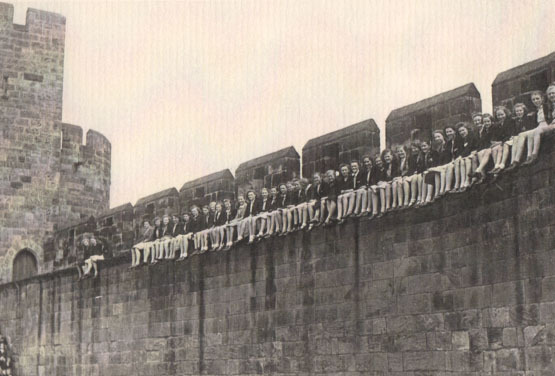 Academic links with China were investigated and, at Sixth Form level, an arrangement with Newcastle School for Boys saw males studying for A Level in some subjects on Tankerville Terrace for the first time. 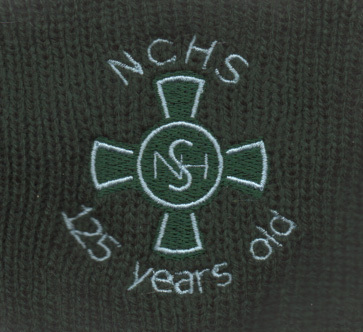 The School celebrated its 125th Birthday in 2009. Despite the name change in 1925, the School badge never altered. In late 2012, territory ventured into in 1894 was revisited ‘in reverse’ when Church High approached G.D.S.T. 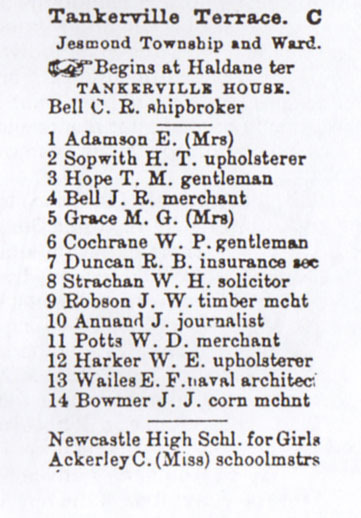 and a merger with Central Newcastle High School was brokered by which Tankerville would again become the home of a Newcastle High School for Girls. 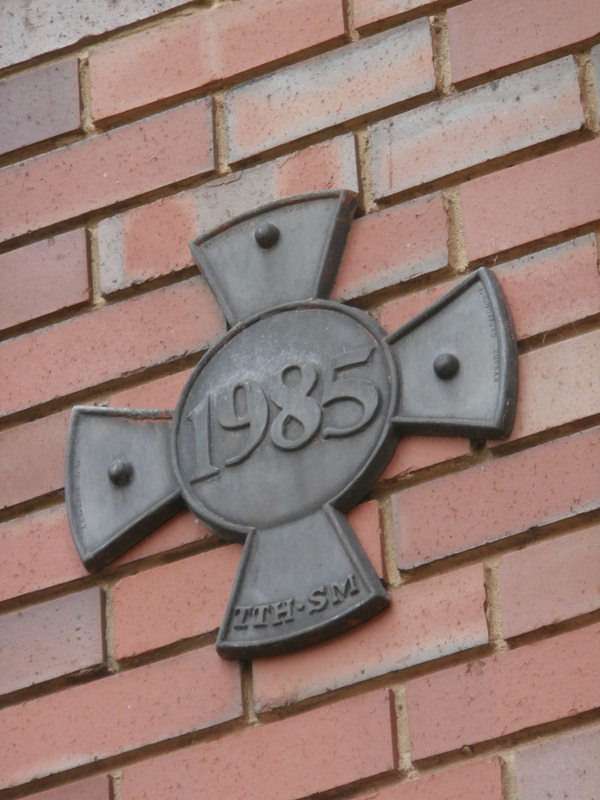 Thriving and feeling strong: Newcastle Church High School with its iconic ivy cross cultivated for the School’s 125th Birthday as it looked when the possibility of a merger was being investigated with the Girls Day School Trust in 2012. Until the mid-19th Century, Jesmond was mainly an agricultural and coal-mining area, so the land on Tankerville secured by the Church Schools Company as the site of the new Newcastle High School was once crop land. By 1631, it can be traced to one of three common fields, the North Field, which roughly extended from St George’s Church to Brandling Park. From Alan Morgan’s book Jesmond from mines to mansions, we learn that each of these fields was divided up into half-acre strips or rigs, then consolidated into larger units of land known as ‘flats’ and ultimately into fenced fields. These common fields all had local names. 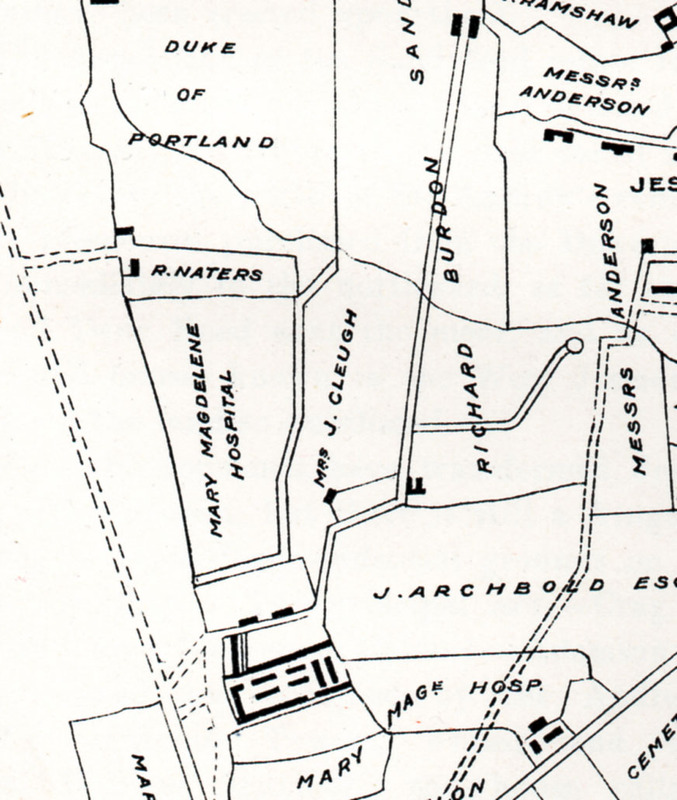 According to the 1902 plan of Jesmond field names published in Frederick Walter Dendy’s An Account of Jesmond, 1904, the land on which the Victorian Senior School was built was part of South Pigs Close. The modern Junior School would later be built on adjoining North Pigs Close and the residential houses (Tankerville & Westward) the School purchased on Tankerville Terrace, on the more whimsically-named Long Friday. 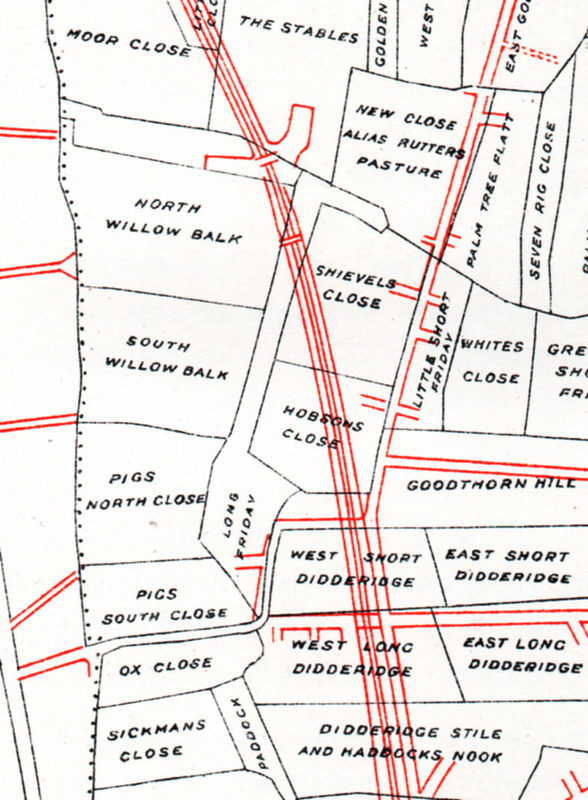 Detail of ‘Plan Shewing (sic) Field Names of Jesmond’, 1902, from F.W. Dendy’s ‘An Account of Jesmond’, indicating the positions of North & South Pigs Close and Long Friday. By 1800, this land was owned by John Blenkinsop Coulson, the largest of three chief landowners in the area. At this date, there were in the region of 80 named fields in Jesmond, which was by now divided into five farms. Our land was almost certainly part of Friday Farm. Its buildings were situated near the present day junction of Haldane and Otterburn Terraces. Alan Morgan’s book reproduces Thomas Oliver’s slightly later 1844 map of Jesmond Township (on page 12) which shows Friday Farm as the building to the left of Burdon Place in the lower left-hand section of the very small segment shown here. 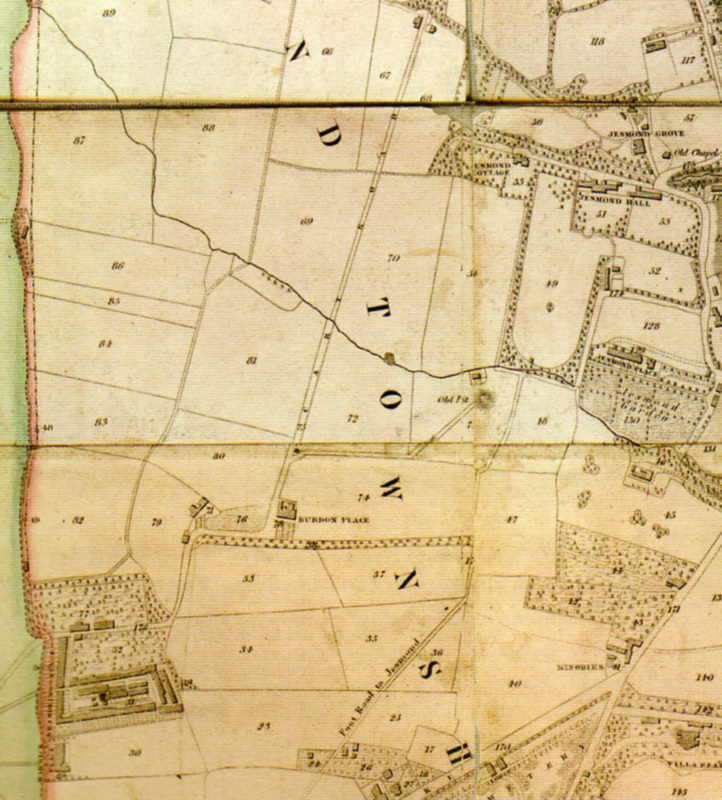 Small section of the 1844 map reproduced in Alan Morgan’s book showing Friday Farm just to the left of Burdon Place, Jesmond Grove (top right), with Friday Fields Lane running down from centre top to bottom left . Mixed within those original fields c. 1800 were rigs bordering the Town Moor from Barras Bridge to St. Andrew’s Cemetery and extending eastward. These had been leased to tenants, but actually belonged to the St. Mary Magdalene Hospital, founded in the 12th Century for the sufferers of leprosy. By 1813, these rigs had been partitioned off and re-apportioned to the Hospital. Others were returned to the Corporation of Newcastle, Robert Warwick and Sir Thomas Burdon. The St. Mary Magdalene Trust thus found themselves owning a lot of valuable land in the township of Jesmond. Via a land award to Robert Hopper Williamson dated 6th November, 1813, we know that Pigs Close was amongst the lands now considered the property of the Hospital (F.W. Dendy, p 153). From papers in Tyne & Wear Archives concerning the building of Church High’s Junior School, we know that this land also belonged to the Magdalene Trust. Indeed, a land map of owner’s names drawn up by T.W. Bell in 1847 (F.W. Dendy, p 176) shows that the whole School was built on Magdalene Trust land. In contrast, Bell’s map (below) shows that the land on which Tankerville Terrace and House were built belonged to a Mrs J. Cleugh, then the owner of Friday Farm. Detail of ‘Plan Shewing (sic) Owners Names of Jesmond in 1847’, taken from T.W. Bell’s Map in F.W. Dendy’s ‘An Account of Jesmond’, showing the relative position of the land owned by the Mary Magdalene Hospital and Mrs J. Cleugh which lie facing each other on opposite sides on Tankerville Terrace. Detail of the 1880 Abstract of Title to a farm and lands called “The Fridays” belonging to the Devisees of Tho. Cleugh, deceased, drawn up by J. & R.S.Watson & Dendy, Newcastle upon Tyne. The Dendy in the firm’s name is the father of F.W. 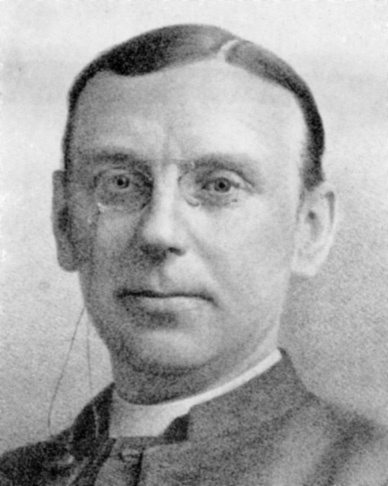 Dendy who wrote the 1904 Jesmond history. 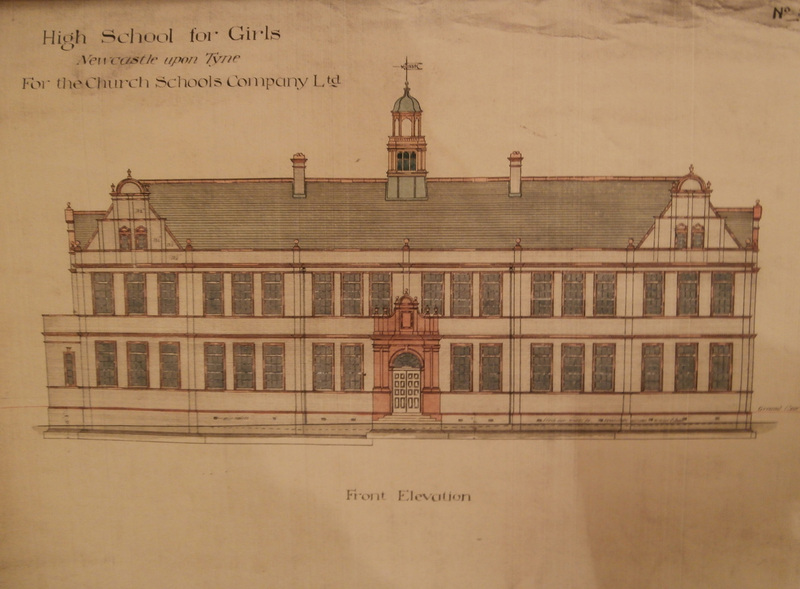 Moving forward to the 20th Century once again, in the accompanying editorial commentary to the 1913 Old Ordnance Survey map of Jesmond published in December 2014, Alan Godfrey includes the following account of the Newcastle High School building’s history. The details clearly bring to mind two well-known old adages: ‘The only constant in life is change’ & ‘Everything comes full-circle’. Godfrey writes: “Jesmond’s first purpose-built school, the High School for Girls, was opened in 1890 in Tankerville Terrace, a development of a school set up in Jesmond Road by the Church Schools Co. in 1885. The earliest etching of ‘The New Church School, Jesmond’ was published in The Monthly Chronicle, Newcastle, June 1890. 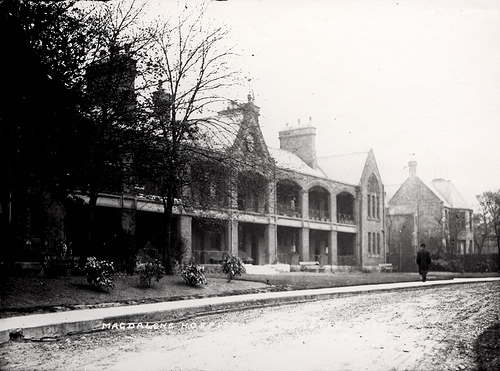 “It was designed by the Newcastle architects Oliver & Leeson, the ornate cupola and Flemish gables giving it the bravado of the Moor Edge institutions [Fleming Memorial Hospital for Sick Children, Northern Counties Orphanage and Northern Counties Deaf & Dumb Institution]. Boarders lived at The Grove, where there was also space for playing fields. The Grove, Newcastle High School Boarding House c 1916. At the end of the final School Assembly, all staff and pupils received a Church High 1885-2014 Commemorative Coin. The Church High Junior School was built on adjoining land which had once served as the Northern Counties Orphanage gardens. The three Moor Edge institutions (including the Northern Counties Orphanage) adjoining Newcastle High School and Tankerville Terrace, 1895 (www.alangodfreymaps.co.uk). Moor Edge photographed in 1927 for ‘Britain From Above’. 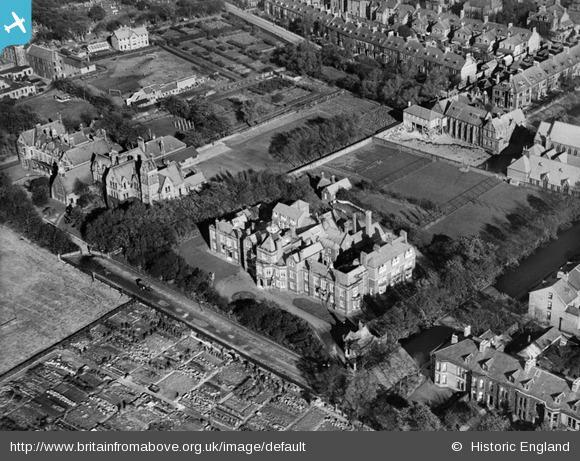 The Northern Counties Orphange Gardens can be clearly seen top-centre of the image next to Church High School (top right) where building work on the very first extension is underway. The southern section of the Northern Counties Orphanage (the Philipson Memorial Orphan Asylum for boys) had by that time become the Princess Mary Maternity Hospital, the place where I was later to enter the world. Thus began my connection with Tankerville Terrace, later reaffirmed, as fate would have it, by a happy and fulfilling 29 year teaching career at Newcastle Church High School. The Church High Centenary commemoration plaque (sadly, no longer in situ at NHSG). I joined Church High as a teacher of English in September 1985, which turned out to be the School’s Centenary year. Sadly, I missed the main celebrations which all took place in the second half of the previous academic year. However, I clearly remember an excited buzz about the place when I arrived for my interview in May – one of the reasons I was so pleased when my application was successful. In my time there, the old High School building was extended on two further occasions, either side of The Millennium, before merger was to change its administrative history once again. This blog began as a record of the changes to the Tankerville site in preparation for its reopening as Newcastle High School for Girls in September 2016. I really do believe that everything in life comes full circle, a belief that has only been strengthened by this research. As I blog about the ending of Church High School, it was fascinating to discover that the person who wrote the letter which brought the School into being, Sir Benjamin Chapman Brown, and I partially share the same name. 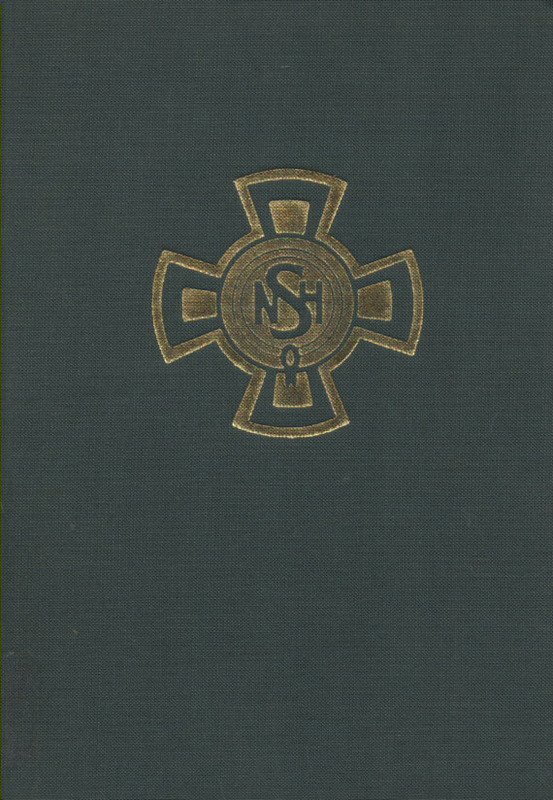 Centenary Book of The Newcastle Upon Tyne Church High School 1885-1985. In 1984 to mark the Centenary, Kevin Brown was commissioned to research and write an updated School History and to catalogue the School Archives. The former was published as part of The Centenary Book of the Newcastle Upon Tyne Church High School, 1885-1985 compiled by Helen Scott and Elizabeth Wise; after cataloguing, the latter were deposited with Tyne & Wear Archives. Anyone wishing to view the Newcastle High/Church High School Archive for themselves can do so between 10.00am and 4.00pm, Tuesday to Friday at The Discovery Museum. The archive catalogue (Reference E.NC17) can be accessed in person or online. 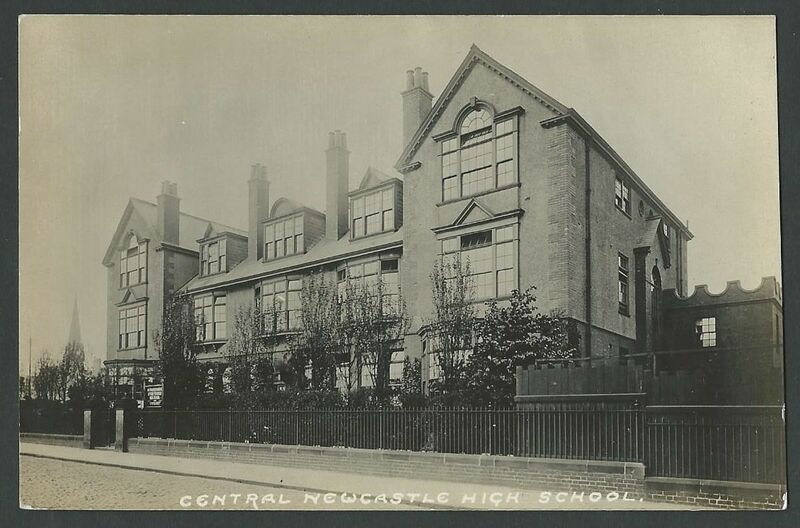 Following my deposit of documents on the final year of Church High and the transition to Newcastle High School for Girls, the catalogue has recently been updated to list accessions related to Newcastle High School (1885-1924) and The Newcastle upon Tyne Church High School up to July 2014. Although the updated catalogue is not yet available at TWA online, it can be viewed via our Heritage site. 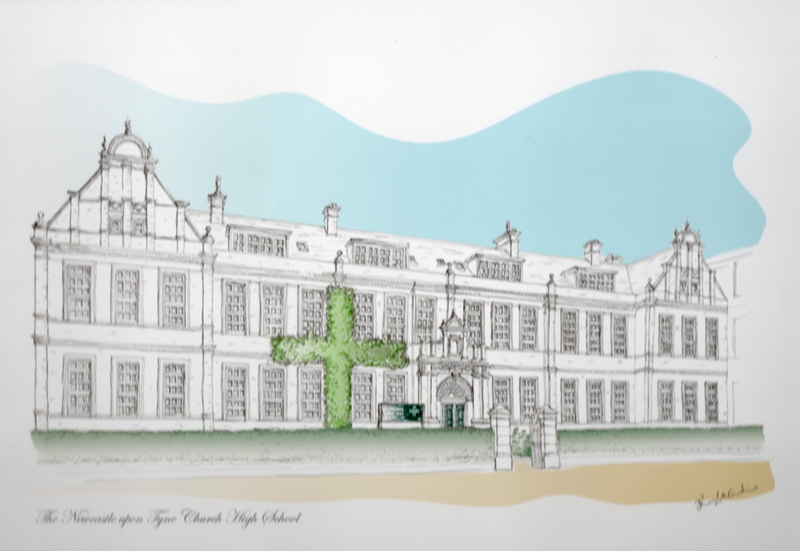 Joanna McCreedie was commissioned to create a commemorative print to mark the closure of the School in 2014.